Although Harry Houdini died in 1926, his name is still synonymous with magic and daredevil escapes. For Spiritualist mediums, however, the name Houdini invokes memories of an unscrupulous Grand Inquisitor. The famous stage magician developed an antipathy toward Spiritualists after a medium failed to contact the spirit of his deceased mother. Bitterly disappointed, Houdini vowed a vigorous campaign to expose all spirit mediums as charlatans and frauds. There was one medium, however, who turned the tables on the great Houdini and exposed him for the trickster that he was. Mina “Margery” Crandon (1888-1941) was one of the most thoroughly investigated spirit mediums of the twentieth century. Born in Canada in 1888, Mina Stinson moved to Boston when she was quite young. In 1918, after an unsuccessful marriage, she became the wife of a senior Boston surgeon, Dr. Le Roi Goddard Crandon, a highly respected instructor at Harvard Medical School. In 1923, Dr. Crandon became extremely interested in psychical research, and he convinced Mina and a number of their friends to begin to explore the possibilities of contacting the dead. Dr. Crandon was astonished when it became evident that his wife was a very powerful medium. After a few sessions, Mina’s deceased brother Walter, who had been killed in a train crash in 1911, announced his presence as her spirit control. Walter, speaking in very earthy language, often sprinkled with profanity, stated that it was his mission to perform mind over matter demonstrations, rather than to deliver flowery inspirational messages from the other side. Within a few months after they had begun the private seances, the Crandons submitted to the first formal investigation of Mina’s mediumship under the auspices of Professor William McDougall, head of Harvard’s Department of Psychology, and a committee from the university. In November 1923, J. Malcolm Bird of Scientific American magazine attended one of the Crandons’ seances and was impressed with the spiritistic manifestations. The magazine was offering a prize of $2500 to anyone who could provide conclusive proof that psychic phenomena truly existed, and Bird asked Mina to submit to a series of their tests. The investigating committee for the magazine included Harry Houdini, Hereward Carrington, Dr. Walter F. Prince, Dr. D.F. Comstock, Dr. William McDougall, and J. Malcolm Bird, secretary of the committee. To protect Mina Crandon’s social standing as the wife of a prominent Boston surgeon and Harvard professor, Bird gave her the pseudonym of “Margery,” which is how she shall always be remembered in the annals of psychical research. The tests began in January 1924 under the strictest of control conditions, and from the very first, Houdini was outspoken in his declarations that he would expose Margery as a fraud. The investigating committee from the Scientific American never seemed to exhaust their list of inventive tests by which they might challenge the abilities of Mrs. Crandon. For one experiment, the medium allowed herself to be encased in a wooden compartment which would permit only her arms and legs to protrude. With her limbs grasped firmly by the researchers, Margery was still able to ring bells, snuff out candles, and set in motion rocking chairs on the opposite side of the room. In order to better investigate the spirit voices which seemed to be under Mrs. Crandon’s control, the Committee carefully measured an amount of colored water which would easily fill her mouth. With her mouth full of the colored water, the voices of Walter and other entities were still able to speak freely and to answer all questions put to them. After the experiment’s completion, the water was removed from the medium’s mouth and remeasured. The color remained the same and the amount of water withdrawn varied not more than a teaspoonful. The water test had not adequately impressed all the investigators, however, so they devised a balloon which could be placed in the medium’s mouth and inflated while the seance was in progress. Once again, the voices were able to engage in free discourse, even though Mrs. Crandon’s larynx was completely blocked off. During one night of tests, Houdini brought an electric doorbell into the seance room and challenged the spirits to ring it for the circle. Once Margery was in a trance state, Walter, the medium’s deceased brother and her spirit control, grumbled about the presence of Houdini. “Still trying to get some publicity by haunting seance rooms, eh?” the spirit voice taunted the magician. Walter then directed Malcolm Bird, secretary of the committee, to take Houdini’s doorbell out of the room so that he might examine it and see what kind of trickery the magician had planned. Bird hesitated for a moment, then picked up the apparatus and left the room. When he returned a few moments later, Bird frowned in displeasure at Houdini, accusing him of having placed pieces of rubber on the contact points of the bell so that it could not possibly ring. Houdini offered no defense of his actions, and he was admonished that dishonesty would do the Committee no service. The words of warning were scarcely out of Bird’s mouth when the electric bell began to ring, and Walter’s booming voice filled the seance room. “How does that suit you, Mr. Houdini?” the spirit control mocked. Houdini’s tricks to confuse Mrs. Crandon were methodically uncovered by the all-seeing spirit guide Walter, and the magician’s attendance at the sessions in the medium’s seance room became less and less frequent. When the Committee demanded that the magician make good his boast that he could duplicate all the effects that the medium had manifested during her seances, Houdini found that he had suddenly been called away on business. In spite of crude and careless acts on the part of certain members of the Committee throughout the grueling tests, Margery Crandon retained her patience with the persistent investigators and produced a remarkable variety of phenomena, ranging from breezes, raps, spirit writing in several languages, independent voice manifestations, apports, and the imprint of spirit fingerprints in paraffin. Many members of the Committee made public declarations that Mrs. Crandon had control of forces beyond the present knowledge of twentieth century science. After six weeks of tests, the committee remained undecided as to the validity of the phenomena produced by Margery, but an enthusiastic Malcolm Bird began writing positive articles concerning the authenticity of the medium’s abilities. Houdini became furious, fearing that the magazine was about to hand over the prize money of $2500 to the Crandons. Houdini felt that his very reputation as a master magician was being challenged and insulted, so he wrote his own report, Houdini Exposes the Tricks Used by the Boston Medium Margery, and had it published as a booklet. As is obvious from the title, Houdini presented his own explanations of how each of the phenomena manifested by Margery had been accomplished through trickery. 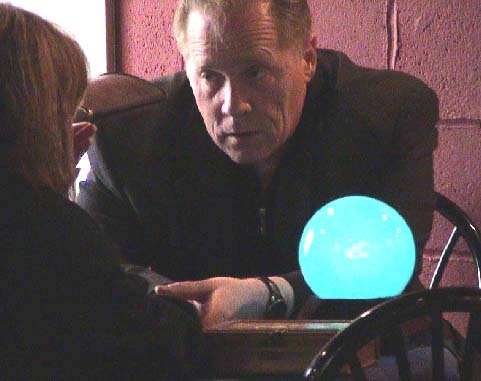 The angry magician even went so far as to accuse two of his fellow committee members, Hereward Carrington and J. Malcolm Bird of having assisted Margery in perpetrating her fraudulent mediumship. Unfortunately for Margery and her many supporters, it was discovered that a fingerprint that had been allegedly left in wax by Walter was found to be that of a Boston dentist, who admitted that he had given Mrs. Crandon a bit of wax in which his own print had been pressed. One such exposure of fraud could not prove that all of Margery’s spirit phenomena had been produced as products of clever deception, but the falsification of her spirit control’s fingerprint caused the majority of researchers who had tested her mediumship to decide that perhaps she had, after all, been too good to be true. Mina "Margery" Crandon, who specialized in conjuring ectoplasmic hands which would dip themselves in hot wax and leave hollow gloves like the ones above (if you look carefully, you can see a "third" hand reaching for the wax in the lower photo whilst the medium's hand are "controlled" by other sitters. Mina Stinson Crandon died in her sleep on November 1, 1941. “Margery” has become a martyr in the minds of Spiritualists, a courageous woman who submitted to test after complex test for the sake of demonstrating the truth of survival after death. For psychical researchers, she stands as a classic example of a talented medium who, though capable of occasionally producing genuine phenomena, from time to time resorted to trickery. For the skeptics, she is simply another clever fraud who deceived the gullible until she was exposed by the harsh light of scientific investigation. For her many supporters, Margery Crandon remains one of the most famous mediums in the world. Including more than 200 true, thought-provoking stories, this inspirational collection provides a fascinating glimpse into the world of unexplained phenomena and survival against overwhelming odds. A wide range of topics and circumstances is covered, including angelic interventions, surviving airplane crashes and cataclysmic natural disasters, medical miracles, amazing sea rescues, miracles on the highway, and near-death experiences. Remarkable stories include how a sky diver plummeted more than 4,000 feet and walked away with only a cut, how a mother and her children ride out a tornado atop an airborne mattress and survive, and how a group of dolphins rescued a swimmer from a shark attack. Steiger was born on 19 February 1936 in Fort Dodge, Iowa, to a mother and father who were farmers. He claims to have lived "in a haunted house with thumps, bumps, doors opening and closing, and men and women walking around all night in period costume. Steiger claims to have written his first book when he was seven years old, and has published 162 books with over 17 million copies in print, including the biography of Rudolf Valentino, later made into a feature film by British director Ken Russell. From 1970-1973 Steiger wrote a weekly newspaper column, The Strange World Of Brad Steiger. He has authored over 2000 newspaper columns. Steiger is married to Sherry Hansen Steiger, a former model. He is a former high school teacher, and college instructor. He began writing when he was a school teacher in his native Iowa when he had writings published in Fate Magazine and other publications. Throughout the 1960s Steiger co-wrote 22 books with other writers. Steiger claims to be politically independent, and cynical of politics. He lists his political heroes, however, as Jonathan Swift, Benjamin Franklin, and Thomas Jefferson. When asked about individuals he admired, Steiger listed Ralph Waldo Emerson, Johann Wolfgang von Goethe, Mark Twain, William Shakespeare, Jesus Christ, Mary Magdalene, William James, Fredric W.H. Myers, Rudolf Steiner, Sir William Crookes, and Mario Lanza as those he would have liked to have met. I believe humankind is part of a larger community of intelligences, a complex hierarchy of powers and principalities, a potentially rich kingdom of interrelated species, both physical and nonphysical. I believe that humankind’s one truly essential factor is its spirituality. The artificial concepts to which we have given the designation of sciences are no truer than dreams, visions, and inspirations. The quest for absolute proof or objective truth may always be meaningless and unattainable when it seeks to define and limit our Soul, which I believe is eternal, evolving higher, seeking to return to the Source from whence it came. I believe that technology plays a far smaller role in the lives of nations than the spirit, for the essence of humankind is its intellect and its Soul. Machines, associations, political parties, and trade balances are but transitory realities that must ultimately wither, decay, and come to nothing. The only lasting truths are Soul, imagination, and inspiration. Steiger and his wife are also animal lovers and believers in animal rights. Steiger claims, "We are appalled by any mistreatment of animals—chemical testing, dogfights, rooster fights, bull fights. We must learn to respect all living things if we are to survive with dignity as a species. I doubt if I could live for any length of time without a dog. Fortunately, my wife and children feel the same. We are all dog owners. Dogs are our connection with nature and the Earth Mother.